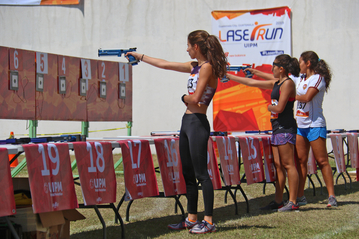 Guatemala has produced excellent Pentathlon results on the world stage and the Laser Run scene also appears to be thriving after a successful UIPM 2019 Global Laser Run City Tour in Guatemala City on March 23. The event, hosted by the Christian Academy in the capital, attracted 198 participants of all ages –from as young as seven to over-60. Organisers were able to build on the progress initiated by the first-ever GLRCT in this Central American UIPM stronghold in April 2018. A spokesperson for the local organising committee said: "The Christian Academy offered facilities that were ideal for such an important event. “Every athlete participated with great enthusiasm and a spirit of fair play, which was amazing to see. We were able to appreciate the joy and solidarity among them, without making any differences due to physical disabilities. “Also, it was nice to have a lot of support during the competition from family, friends and all the staff who were responsible for organising the event. “Coaches from different institutions were there too, watching their athletes and evaluating the progress they had made in recent months." The Global Laser Run City Tour was created in 2017 to provide an entry point to UIPM Sports for people of all ages in urban communities around the world. Another 100 cities have been selected in 2019 as hosts of the GLRCT or the Biathle/Triathle National Tour. The full calendar can be viewed at the UIPM website, where you can also find more information on UIPM’s various multi-discipline sports. In September, the UIPM Laser Run World Championships will be incorporated into the Pentathlon World Championships for the first time in Budapest (HUN), where Laser Run is also on the programme for the 1st World Urban Games. In December, Laser Run and Triathle will both feature for the first time in the 30th Southeast Asian (SEA) Games in the Philippines. Have you liked the UIPM Laser Run page on Facebook yet?